Alpha’s Discovery Kids is a licensed daycare and preschool for 69 children. Our ratios are in accordance with the Day Nurseries Act which is as follows: Toddler 1:5, Preschool 1:8. We offer both full-time and part-time programs to meet the needs of busy parents while offering competitive rates. We also accept subsidy with the Region of Peel. Our full-time program runs Monday to Friday from 7:00 a.m. to 6:00 p.m.
We offer many flexible options for our part-time program. The Nursery School Program runs Monday-Friday from 9:00-11:30 am with the flexibility of attending between 2-5 days per week. Nursery School is perfect for stay-at-home parents that want to expose their child to a group environment where they will learn academics and social skills in preparation for Kindergarten. The half-day program runs for any time period up to 5 hours per day. You can choose to attend between 2-5 days per week. This program is perfect for parents with varying schedules as it allows parents the flexibility to choose the time of day that the child will be attending. The full day part-time program is great for parents who only want to send their child for full days on certain days of the week. You can choose to attend 2-3 days per week. Our toddler programs includes children between 12 months – 2.5 years old. We have two toddler classes: Junior Toddlers and Senior Toddlers. We have split the toddler group into Junior and Senior classes to allow for better programming for children according to their age and stage of development. Our Jr. Toddler Room is for children between 12-23 months. Our Sr. Toddler Room is for children between 24-30 months. 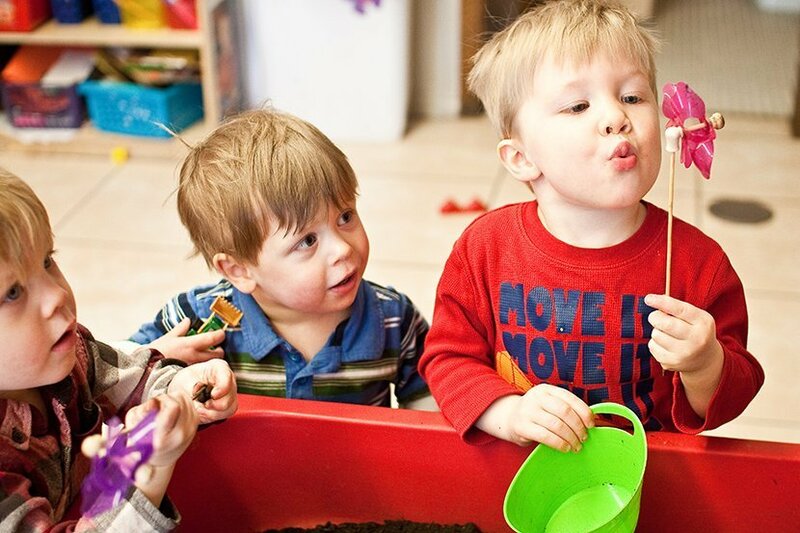 In both toddler programs, there is an emphasis on sensory-based activities because, as we know, toddlers learn best by exploring while using their senses. At this age, we start to develop academic skills through an introduction to numbers, shapes, colours and letters by incorporating these concepts into the child’s play and exploration. Teachers will plan various creative activities based on the interests of the child as we aim to keep activities fresh and engaging. Music and movement is a fundamental part of the program as well. 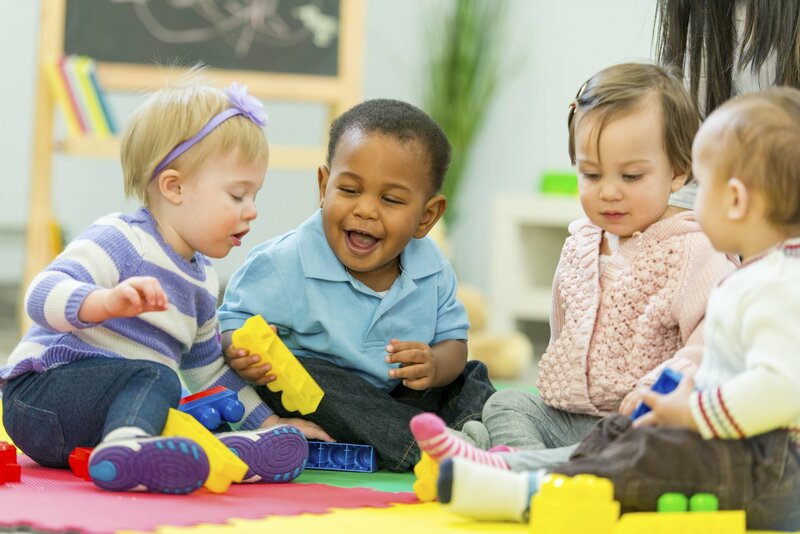 When you visit the daycare, you will always hear children’s music playing in the background as it fosters a happy and active environment. Toddlers also participate in the award-winning Kindermusik program once per week. 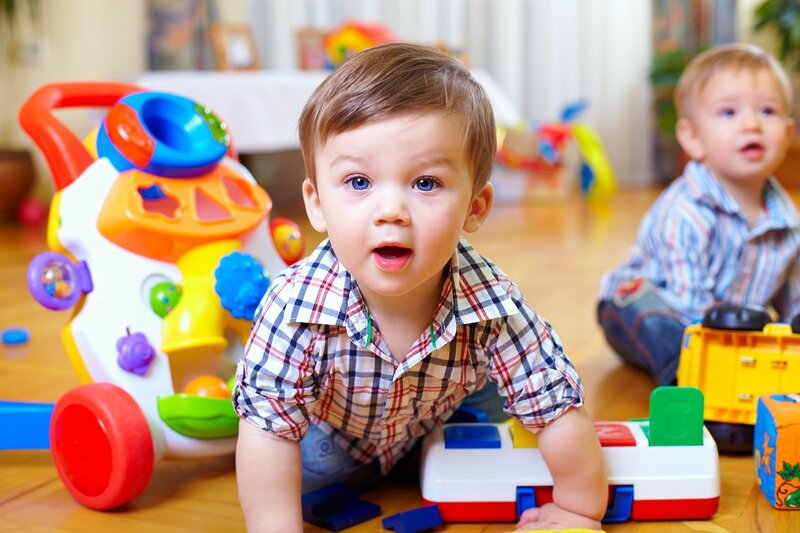 We ensure that the interest areas in the toddler classrooms include materials to spark their imagination and learning including: blocks, table toys/puzzles, book, dramatic and sensory areas. The toys and planned activities in each interest area are changed weekly depending on the children’s interests. Circle time is an important time at Alpha’s where the teacher will engage with the children as a large group. Our teachers will read to toddlers as a large group as it helps to develop their attention and circle time skills. When it comes to potty training, we work closely with the parents to encourage it when the child shows interest and readiness. We assist parents with this process to ensure success! We play outside twice a day in our covered and secure outdoor playground to engage the children in activities that promote active movement and physical activity. The Junior Preschool program includes children between the ages of 2.5 – 3.5 years. We focus on five core subject areas: Language, Math, Science, French and Music. Through child-initiated and teacher-supported experiences, children learn many concepts including letters, colors, shapes, numbers, size, position, patterning, sequencing, vocabulary, rhythm and listening skills. As part of our language and literacy program, we follow the acclaimed Jolly Phonics literacy program. The Jolly Phonics program has been proven to encourage early reading and writing skills in a fun and creative way. Jolly Phonics focuses on learning letter sounds and formation, then blending those sounds to read words. The French instruction program starts in the Junior Preschool classroom. Children receive daily French instruction to learn letters, numbers and basic French vocabulary. We ensure that the interest areas in the preschool classroom includes materials to spark their imagination and learning including: blocks, table toys/puzzles, book, dramatic, science and sensory areas. The toys and planned activities in each interest area are changed weekly depending on the children’s interests. 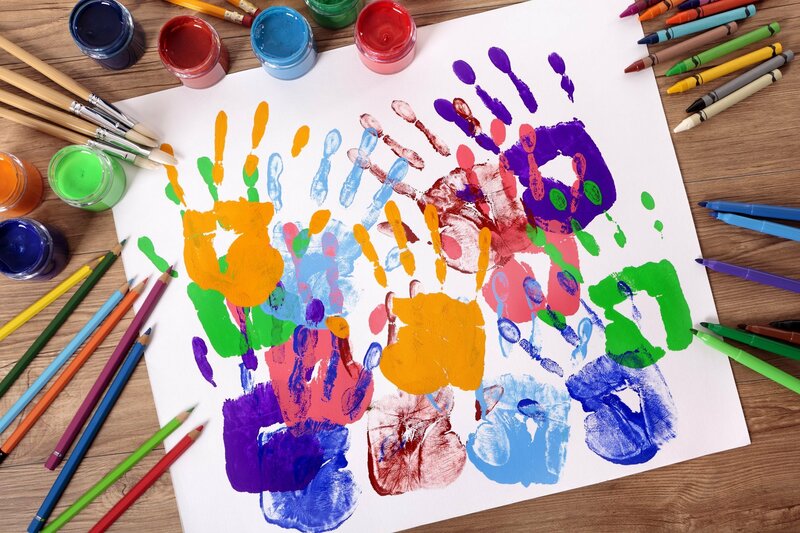 Children are encouraged to express themselves every day through creative activities. During small group time, children are exploring something new or expressing themselves creatively. Music and movement is a fundamental part of the preschool program as well. When you visit the preschool, you will always hear children’s music playing in the background as it fosters a happy and active environment. Children also participate in the award-winning Kindermusik program once per week. The Senior Preschool program includes children between the ages of 3.5 – 5 years. We focus on five core subject areas: Language, Math, Science, French and Music. Through child-initiated and teacher-supported experiences, children continue to develop the concepts they learned in Junior Preschool including letters, colors, shapes, numbers, size, position, patterning, sequencing, vocabulary, rhythm and listening skills. We ensure that the interest areas in the preschool classroom includes materials to spark their imagination and learning including: blocks, table toys/puzzles, writing, book, dramatic, science and sensory areas. The toys and planned activities in each interest area are changed weekly depending on the children’s interests. The Senior Preschool program places a large emphasis on independence to get children ready for the requirements of the public or private school system. Alpha’s Discovery Club camp programs in Mississauga offer a variety of fun and intellectually stimulating activities for children aged 3-9 years old. The Camp programs include a balance of physical, social and intellectual activities to stimulate the whole child. Each week, a new theme is introduced and all activities are focused on that theme. Children participate in drama, arts & crafts and sports workshops as well as co-operative games. The camp includes a balance of indoor and outdoor activities, as weather permits.